1. It attracts prospective workers and helps retain talented workers already in the organization. 2. It produces higher quality work and better customer service, because a motivated, happy worker is more engaged. 3. Employees feel encouraged to do more than is expected. That means managers must LEAD BY EXAMPLE, and encourage high levels of work performance by rewarding his or her employees, opposed to punishing employees when their performance is not satisfactory.2 Be sure to reward overachievers and any employees who take initiative, in order to reinforce this productive behavior. Never manipulate commissions or cap bonuses because this diminishes employee trust in your organization. Positive reinforcement – the use of positive consequences to encourage desirable behavior; such as a manager promoting an employee. Negative reinforcement – the removal of unpleasant consequences following a desired behavior; such as a manager stopping his or her nagging of an employee. Extinction – the withholding of positive rewards for a behavior so that it is less likely to occur in the future; such as a manager withholding a bonus from a lazy employee. Punishment – the application of negative consequences to change an undesirable behavior; such as a manger demoting an employee. Managers should seek to apply positive reinforcement, but should only reward employees immediately after they exhibit desired behavior, not expected behavior. You should clearly communicate your expectations and use different rewards that address individual differences. While someone else may take on some of the unfinished work of a slacker, this is a waste of time and money. Remember, the manager should use positive reinforcement whenever possible.9 He or she should approach a lethargic employee, and motivate him or her by complimenting what the employee has done well and by noting that the employee’s lackluster performance will impede the completion of the company’s goals. The manager should inform the employee that the company cannot afford to allocate its resources toward someone who is not doing his or her part, and that further action will be required if performance does not improve. Often, this is enough to do the trick. Managers are judged on their abilities to delegate – to get work done through others. They must ensure that the goals of their subordinates align with the goals of the organization as a whole in order to delegate effectively. This means motivating employees by establishing appropriate extrinsic and intrinsic rewards. An extrinsic reward is payoff – such as money received from performing a particular task. But money is only a short-term motivational tool, and will not lead to long-term commitment.10 Consequently, intrinsic rewards are equally as important. An intrinsic reward is the satisfaction that a person receives from performing a task. But how do you elicit this sense of satisfaction? People. The most important motivator is people. This includes co-workers, management and anyone else that your employees might interact with on a daily basis. More than anything, your employees seek to surround themselves with good people. Challenge. The second most important motivator is a challenging work environment. Your employees want to be stimulated by new work every day. They don’t want to be assigned tedious tasks that bore them from 9 to 5. Give your employees reason to feel as though their work is meaningful. Opportunity. Thirdly, your employees want to feel as though their jobs present great opportunities. They want to be reassured that they made a wise decision in working for your company. Help your employees view their jobs as privileges, not just sources of necessary income. Personal Growth. This is the fourth most important motivator. Your employees want to avoid feelings of stagnancy at all costs. They want to feel as though they are working toward something better. Reward your employees often, and provide them with incentives to work attentively. Money. Hardy says that money is actually the least important motivator. Yes, your employees work primarily to bring in an income, but this income is not what motivates them to perform their jobs optimally. Money is the motivator for them to come into work every day, but psychological motivators are what keep them happy and diligent. Because employees know their wants, a good management practice to establish rapport with your employees is to hold regular one-on-one interviews. Set goals together and stress the importance of this activity. It is perhaps the best way to stay on track and grow as an organization. Setting goals with your employees makes them feel like members of a team. By communicating management’s overall goals for the project, including the requirements to complete the task, ensures that everybody is on the same page when it comes to results. Interviewing your employees also allows you to address any of your employees’ grievances and discuss solutions. Interviewing your employees helps them feel as though their opinions matter. Always listen to your employees, because for your company to be successful, you don’t need to be happy, they do. This will also help you establish specific employee incentives. These may include paid days off, the option to work at home, and the ability to determine their own schedules. This practice is known as flextime.14 Although the number of hours (core time) might not change, he or she may be permitted to work, for example, from 12 to 8, rather than 9 to 5. When implemented properly, flextime motivates employees by making them feel more independent and by giving them time to accommodate non-work commitments, such as their families.15 But be careful, as flextime complicates the manager’s ability to supervise the employee, and it may create resentment between employees who are offered flextime and those who are not. 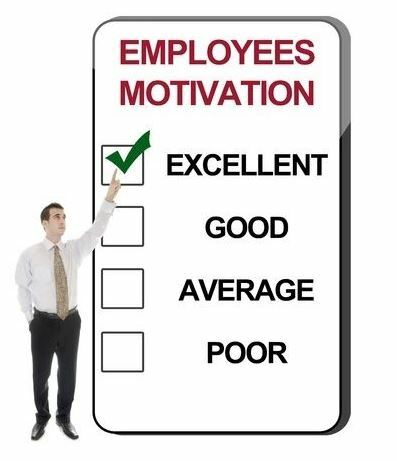 Use a job diagnostic survey to determine the level of employee motivation. Determine which core factors need to be reevaluated. Redesign the job to improve the areas where there is low satisfaction. Of course, this will require communication between the manager and their employees; if management is unable to communicate to its employees what the company expects and wishes from them and for them, all motivation is lost. Lack of communication distances employees from their employers and causes them to be both less willing and less able to work effectively. Communication is the cornerstone of motivation. Employee motivation is essential to maintaining an effective workplace. A motivated workforce will always attract and retain talent, produce higher quality work, and encourage employees to go above and beyond what is expected of them.